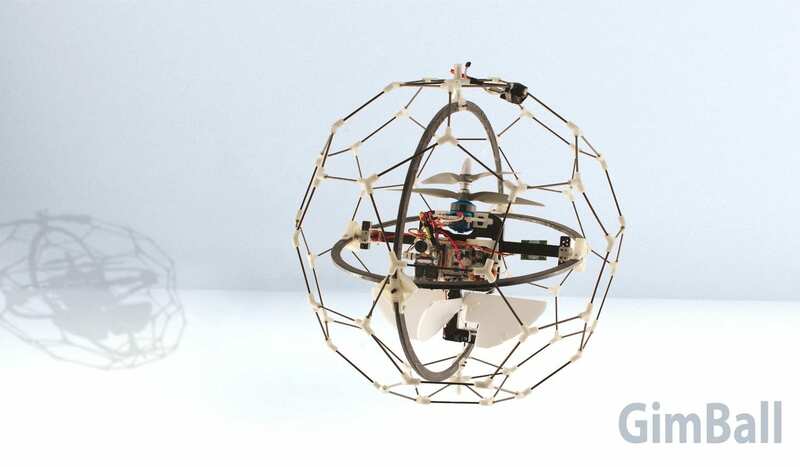 GimBall and the AirBurr, are robots designed specifically to study the physical interaction between flying robots and their environment. Robots capable of flight in cramped and cluttered environments have many advantages over their ground-based counterparts, but most current systems suffer from the same fundamental problem: any contact with obstacles has catastrophic, mission-ending results. What if instead of avoiding collisions, a flying robot can become robust to them, and even take advantage of contact with its environment? GimBall is equipped with a passively rotating protective cage, which keeps it stable even during collisions. It can therefore fly in very cluttered environments without fearing contacts. April 17, 2019 - Cargo capsule en route to space station from Virginia My9NJA *fresh* grocery shipment rocketed toward the International Space Station on Wednesday after launching from Virginia's seashore. April 17, 2019 - Antares rocket blasts off Wednesday afternoon from NASA's Wallops Flight Facility in Virginia WPTV.comWALLOPS ISLAND, Va. — A *fresh* grocery shipment is on its way to the International Space Station after launching from Virginia. WATCH ROCKET LAUNCH:. April 12, 2019 - Robotic 'Beeings' Take Over Space Station [VIDEO] ThomasNet NewsThese hovering helpers will look to lighten the load. April 9, 2019 - Drones' Newest Cargo Might Just Be Human Organs Smithsonian.comSurgeon Joseph Scalea is developing a cooler, biosensors and an online platform with GPS to monitor organs in transport in real time. March 31, 2019 - Designing vehicles that drive, fly — and swim MIT NewsCrystal Winston, an MIT senior in mechanical engineering and a Marshall Scholar, is pursuing her vision of a world where cars aren't limited to roads. April 8, 2019 - NASA to send self-charging robotic bees to space Technology Times PakistanNASA is sending some self-charging 'robotic bees' up to the space station to help astronauts, basically a collaboration between humans and robots. October 25, 2018 - Tiny flying robots haul heavy loads in amazing video Fox NewsA remarkable video released by Stanford University shows tiny flying robots that have been modified to move loads up to 40 times their weight. March 21, 2019 - Archytas First Robotics competition team wins Spirit Award MountaintimesOver the weekend of March 15-17, Archytas #6933 First Robotics Competition team attended its first meet of the season, bringing home. September 13, 2018 - This flying robot could reveal secrets of the aerial world of insects Science NewsA new winged robot with the exceptional agility of a fruit fly could lend insight into animal flight. May 15, 2018 - This Insect-Sized Flying Robot Is Powered by Lasers WIREDIt's the first robo-fly that doesn't need to be tethered to a power supply. February 6, 2019 - See the Tiny Flying Robots That Could One Day Explore Space FuturismThe latest version of the ionocraft — a tiny robot that uses ion propulsion to fly — is slightly larger than its predecessor. November 2, 2018 - Slightly heavier than a toothpick, the first wireless insect-size robot takes flight CNBCWith the rapid advances in drone technology spanning the 20th century, it should come as no surprise that robotics are being reinvented on the insect scale. January 15, 2019 - Quickdraw: Flying robot scans shelves faster than clerks, ground robots ZDNetBrick-and-mortar retailers are using autonomous mobile robots to keep track of inventory and fight back against ecommerce. May 22, 2018 - Star Wars-inspired flying robots joining space station crew Fast CompanySmart NASA Astrobee robots the size of Jedi training droids will help astronauts on the International Space Station work faster and be more productive. September 16, 2018 - Acrobatic Robots That Mimic Insect Flight May Be The Future of Drones Interesting EngineeringResearchers at TU Delft have developed a novel free-flying and agile flapping-wing robot that mimics rapid insect flight. February 5, 2019 - Penny-Sized Ionocraft Flies With No Moving Parts IEEE SpectrumA drone powered by electrohydrodynamic thrust is the smallest flying robot ever made. January 6, 2019 - Chattanooga companies use 'flying robots' to make jobs safer, easier Chattanooga Times Free PressWould you rather be a lineman elevated high above the road in a bucket inspecting a power line or a sewer worker crawling underneath city streets? February 14, 2019 - For Micro Robot Insects, Four Wings May Be Better Than Two IEEE SpectrumAn extra pair of wings makes robot insects much easier to control. December 20, 2018 - There’s No Real System to Counter Rogue Drones The AtlanticAs flying robots proliferate, there's a growing risk of accident or attack. And the U.S. is still a long way from being prepared. October 30, 2018 - What hovering animals can teach us about flying robots Engineers JournalTo find out, ​engineers teamed up with ecologists in Costa Rica to meticulously record the flight of over 100 different bats and hummingbirds. February 6, 2019 - This Birdlike Robot Uses Thrusters to Float on Two Legs WIREDLeonardo the lanky robot can sort of hover-walk on two legs—and that could land it on Mars one day. January 13, 2018 - These flying robots invented by University of Pennsylvania researchers can self-assemble in flight QuartzResearchers at the University of Pennsylvania have developed a series of modular flying robots that can autonomously assemble themselves in midair and fly. November 8, 2018 - These robots fly and swim just like animals CNNGerman company Festo hopes to learn from the natural world to improve the future of automated machines. September 23, 2018 - Here come the flying robots Business TodayIn December this year, drones will begin flying across Indian skies for surveys, photography, and mapping. September 19, 2018 - Insect-inspired flying robot, DelFly Nimble developed by Dutch University DroneDJTU Delft scientists developed an autonomously flying robot that mimics a fruit fly. The DelFly Nimble may open up new possibilities for drone applications. June 28, 2018 - Military Repair Depots Eye Flying Robots, 3D Printing to Improve Ops Military.comMany U.S. Army and Marine Corps equipment repair depots are turning to robotics to keep up with the future force. May 14, 2018 - A jumping spider might inspire the next generation of flying robots QuartzThis jumping spider can leap six times her body length. And she could be the key to building flying robots in the future. February 4, 2019 - Caltech Building Agile Humanoid Robot by Combining Legs With Thrusters IEEE SpectrumLeonardo augments humanoid legs with thrusters to help it run and jump. February 7, 2019 - This Robot Can Run, Jump and Fly but Most Importantly Never Falls Down Interesting EngineeringLEO the robot can walk, jump and fly. Created by Caltech the bipedal robot ever falls thanks two drone-like thrusters. January 9, 2019 - The flight path for drones unveiled at CES Reuters.comDrone makers are setting their flight path away from consumer toys and on businesses willing to shell out for flying robots. June 26, 2018 - The Digest: This Floating Robot DRAGON Can Change Shape Mid-Flight FuturismDRAGON is a flying robot that can autonomously decide to change its shape mid-flight to fit through narrow indoor openings. July 3, 2018 - Disney stunt robots could make its parks more like the movies QuartzThe stunt robots could make Disney's theme-park figures more like the action stars in its films. June 24, 2018 - Flying robots, hot glass, Google, 3-D flesh, NextFab: Philly’s first Maker Faire at Pennovation Philly.comOrganizers of this year's first Philadelphia Maker Faire are planning a much bigger event for next year. November 1, 2018 - Small Drone Is Designed for Heavy Loads ENGINEERING.comStanford researchers develop small flying robots that can move objects and anchor to objects. May 30, 2018 - First Untethered Insect-Sized Flying Robot Developed - iHLS i-HLS - Israel Homeland Securityעברית (Hebrew). An insect-sized flying robot could help with time-consuming tasks like surveying crop growth on large farms or sniffing out gas leaks. June 28, 2017 - Drone Age - Rise of the Flying Robots ENGINEERING.comHow UAVs are shaping the future of warfare, recreation and everything in between. November 16, 2018 - Police drones: Coppers to use flying robots to track offenders back to their homes RTA UK police force is being trained to operate drones, enabling them to take images of anti-social offenders with the potential to follow them to their homes. January 31, 2017 - The Future Belongs to Flying Robots FuturismThe University of California system's Center of Excellence on Unmanned Aircraft System Safety is hard at work looking into the future of unmanned aircraft.